ExchangeWire Research & Oracle Marketing Cloud A Data Management Platform (DMP) is a piece of technology that ingests data from multiple sources, creates meaningful segments of data such as audience segments, and then facilitates the activation of those segments through media buying channels. 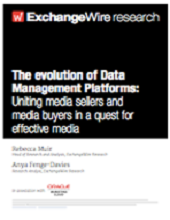 DMPs can be used by both media buyers and media sellers, although the use case varies accordingly. As a relatively recent addition to the marketing technology stable, DMPs are sometimes misunderstood and seen as a panacea to all data challenges or hero solutions to automate all media training.